I didn’t really want to watch this game, much less write about it. I’m sure none of you want to read about it. 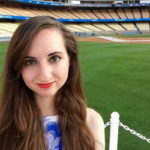 But I’m here, and you’re here, so here are some words about the seventh consecutive Dodgers loss. The Rockies jumped on Clayton Kershaw early, putting up three runs in the first inning thanks to a Nolan Arenado three-run home run. In fact, the first four batters of the game reached via hit before Kershaw managed to record his first out. Suboptimal! Of course, Kershaw (and the rest of the Dodger pitching staff) would’ve had to be nearly perfect, as the Dodger offense was, once again, anemic. Cody Bellinger doubled in the fourth inning (his first of two on the night), and came in to score on a Yasiel Puig two-out two bagger, making it 4-1, Rockies. But that’s about all the Dodger bats managed. This was hardly a banner night for the Dodger bullpen, either. Brock Stewart took over for Kershaw in the fourth, and gave up two runs in the fifth to make it 6-1. Brandon Morrow allowed a pair of hits to open the sixth, but worked out of the jam to post a scoreless frame.Edward Paredes gave up his first home run (and first run) of the season in the seventh to make it 7-1, and was lifted after loaded the bases without recording an out. Josh Ravin took over, and walked in the Rockies’ eighth and ninth runs of the night before bringing the inning to a close. 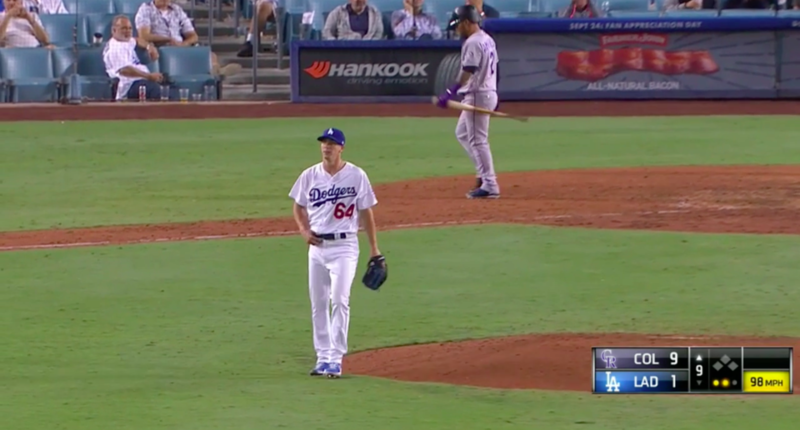 If the Dodgers wanted a low-pressure situation for Walker Buehler to make his major league debut, they weren’t going to find an occasion much better than this. Sure enough, Buehler pitched the final two innings, and was impressive, touching 99 MPH several times and even hitting 100 on one pitch, according to Gameday. Buehler worked around a leadoff single in the eighth to face the minimum, and picked up his first two big-league strikeouts in a perfect ninth. The Dodgers still have the best record in baseball (for now). They still have a double-digit divisional lead (for now). At this point, they’re two wins away from, at the very least, a guaranteed playoff berth. Their position is still very good, and still enviable. But this really cannot continue. It’s gotten depressing to watch, and it’s rapidly approaching the point of being legitimately worrisome. The Dodgers, now 92-48, and the Rockies, now 75-65, face off again in game two of four tomorrow night. Yu Darvish (4.09 ERA, 4.08 FIP, 3.44 DRA) will be on the mound against German Márquez (4.26 ERA, 4.13 FIP, 5.06 DRA). First pitch is 7:10 PM Pacific.